Living in a small state like Vermont has its benefits. Nothing’s that far apart, and since the state has 20 downhill ski resorts, getting to one or another isn’t all that difficult. Sure, the mountains aren’t as big as the ones out west. But there’s still a lot of great skiing, and there’s a certain amount of New England charm that gives it a special vibe. 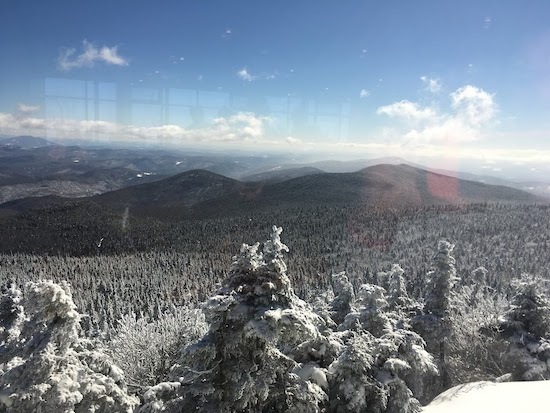 So two weeks ago I decided to take advantage of geography and do what any self-respecting Ski Diva would do: take a mini ski safari — five mountains in five days in the Green Mountain State. Stop #1: Okemo Mountain Resort. Yes, Okemo is my local hill, which makes skiing there sort of a no-brainer. But since it’s one of the five I skied in five days, it’s only fair to include it here. 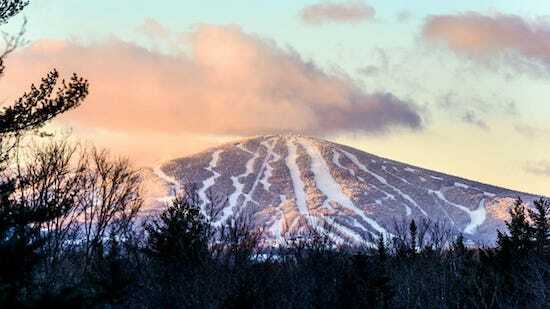 Okemo was bought by Vail Resorts at the very beginning of the season and is now part of the EPIC family. Vail has already promised to renovate two lodges: the Summit Lodge and the Sugar House. I’m sure there’ll be additional improvements down the road. 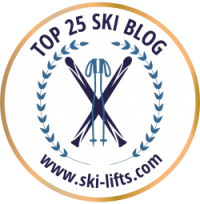 What do I love about Okemo? Well, first, it’s home. 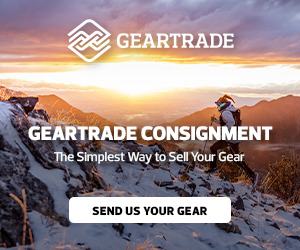 You can’t discount that in a ski area. Having a home mountain means you have a place you’re completely familiar with, where your friends ski, where you just feel comfortable. I can always count on running into someone I know, so I know I’ll always have a good time. Second: Okemo is a cruiser’s delight, and I defy anyone to rip down a trail like War Dance without a silly grin on his face. And third: snowmaking & grooming. This can make a huge difference, especially in the east. Okemo is often recognized by SKI magazine for this, and believe me, it’s not unwarranted. .
Fun fact about Okemo: There’s an old fire tower at the top of South Face that you can drive or hike to in the off season. Climb it for a great 360° view of the Green Mountains. Highly recommend. To me, Stratton and Okemo have a lot in common. They’re both excellent for cruiser and great for families. True, they’re not the most challenging mountains around. And Stratton’s base village has a bit of a Disney-esque feel. But the mountain is easy to navigate with lots of lifts, the groomers are loads of fun, and there are some nice bumps and trees to shake things up a bit. Unfortunately, conditions didn’t warrant dipping into the woods. Another time, perhaps. This year Stratton installed a new express quad in the Snow Bowl part of the mountain. It’s a big improvement over the old lift — the ride time is 5 minutes instead of 14 — and it makes skiing in that area a lot more enjoyable than it was in the past. Favorite Trails: Polar Bear, Upper Middlebrook, Upper & Lower Liftline, Upper & Lower Spruce, Upper Kidderbrook. Fun fact about Stratton: It was the first ski area to allow snowboarding and had the first half pipe and formal terrain park on the east coast. Killington’s been in the international spotlight lately. For the past three years, it’s hosted the Women’s Audi FIS World Cup, attracting such ski luminaries as Mikaela Shiffin and Laura Gutt. There’s a reason the FIS chose Killington to host the race: it’s big, it’s easy to reach from urban centers in the east, and it does a great job managing crowds. Killington’s been on a bit of an upgrade kick over the past few years. 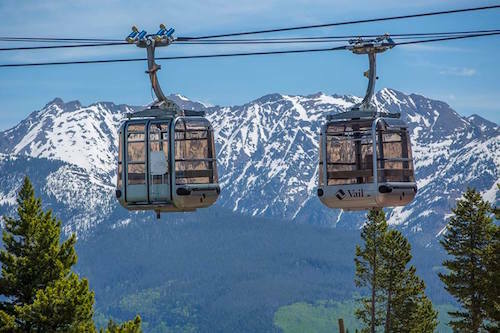 They’ve installed RFID technology on the lifts, new cabins on the K-1 gondola, a new 6-person bubble chairlift (to replace the Snowden lift), and a quad chairlift on the mountain’s underserved South Ridge area. Recently, Killington announced that it’ll be doing even more upgrades in the next year or so, including the construction of a new base lodge to replace the one that’s been there forever. 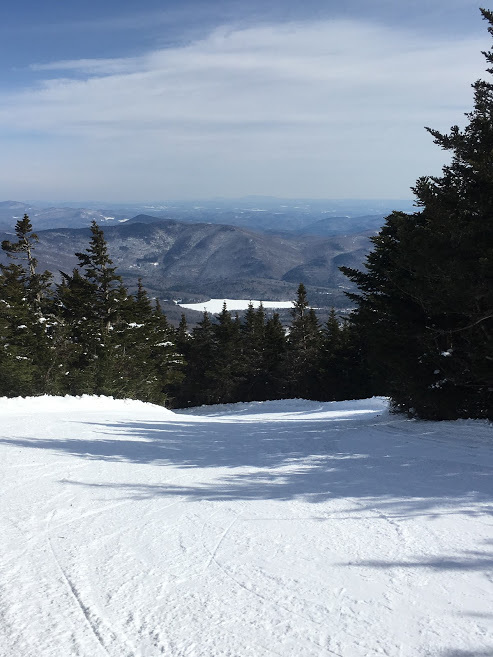 Skiing Killington is fun, though it can be a bit confusing; just make sure you have a good trail map and plan your day so you end up in the same area you parked your car. 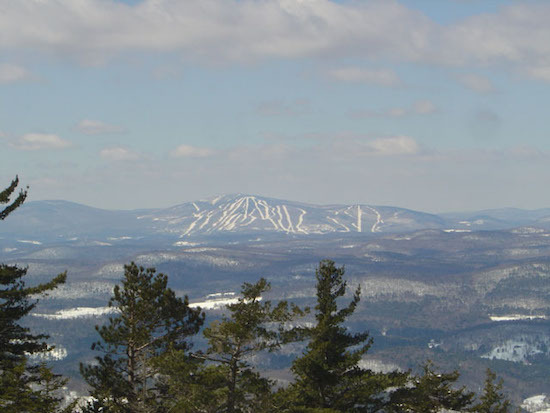 The self-proclaimed Beast of the East is the biggest ski area in the east and sprawls across five peaks. There’s great terrain and tons of variety — enough to challenge everyone. You will not get bored. Highly recommend: Lunch at the Summit Lodge. Sure, it’s a bit pricey. But the views are to die for. Also, ski biking! I tried this last winter, and holy moly, is it fun! See my blog post about it here. Trails to ski: Ski in the tracks of Mikaela Shiffrin. 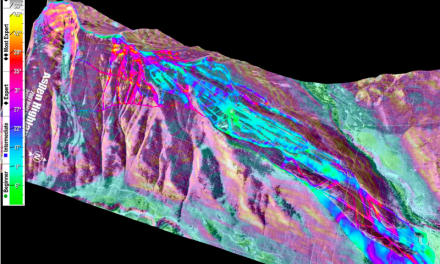 Don’t miss Super Star, the trail used for the Women’s Audi FIS World Cup. 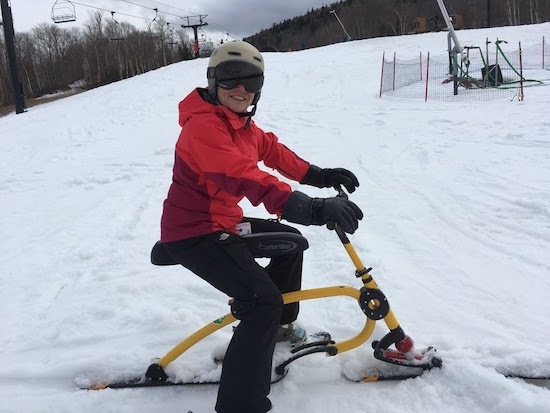 Definitely try ski biking at Killington. OHMIGOD it’s fun. I have a real soft spot for Sugarbush. Why? 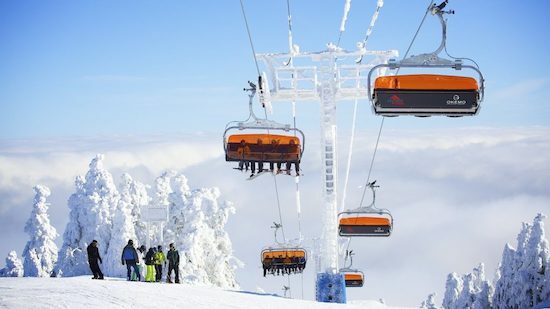 First, it strikes a great balance between being a skier’s mountain and a family destination. 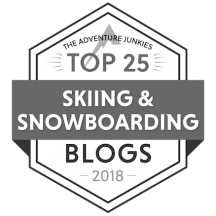 There’s plenty of expert terrain — more than 40% of the mountain is rated black diamond — but there’s still enough to keep intermediates and beginners happy. 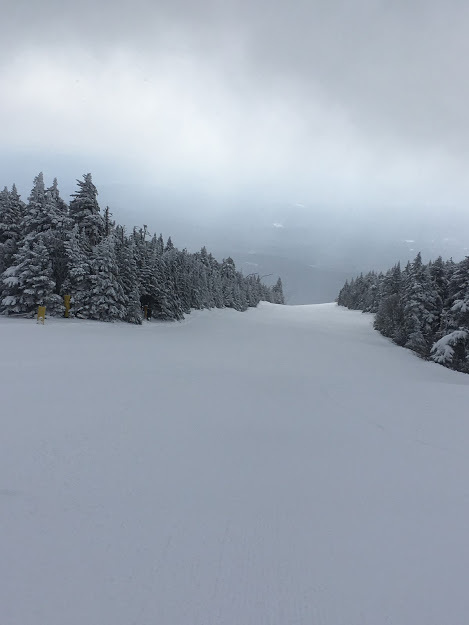 Instead of the broad groomers that make one mountain pretty interchangeable from the next, Sugarbush has terrain with character. There are lots of the traditional, winding New England trails that offer a surprise around every bend. There’s plenty of tree skiing and bumps. And there are spectacular views; look one way, and the Green Mountains stretch out before you; the other, Lake Champlain. What’s more, Sugarbush has what can only be defined as a Vermont vibe. It’s as if the place was weaned on maple syrup. And yes, it makes a difference in the atmosphere. 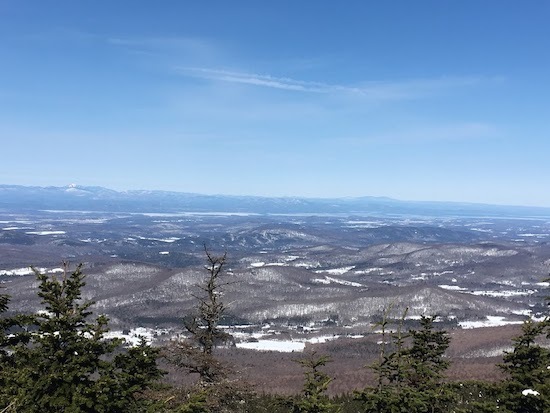 On a clear day, you can see Lake Champlain from the top of the Heaven’s Gate lift. That’s Whiteface in NY State on the far left. Jester winds around from the top of Sugarbush like a corkscrew. So much fun! Although it’s owned by Killington, Pico has more in common with Sugarbush than it does with its huge next-door neighbor. The smallest resort in this lineup, Pico is a lot quieter, a lot more low key, a lot more old school than the big K. Many of the trails wind around like old logging roads, offering spectacular views and loads of character. If you’re looking for glitter and glitz, you won’t find it here. All you’ll find is great skiing. Fun fact about Pico: The mountain was founded by the Mead family, whose daughter, Andrea Mead Lawrence, was a three-time Olympian and the first American alpine skier to win two gold medals. The top of Upper Ka, a winding black trail that’s a heck of a lot of fun. 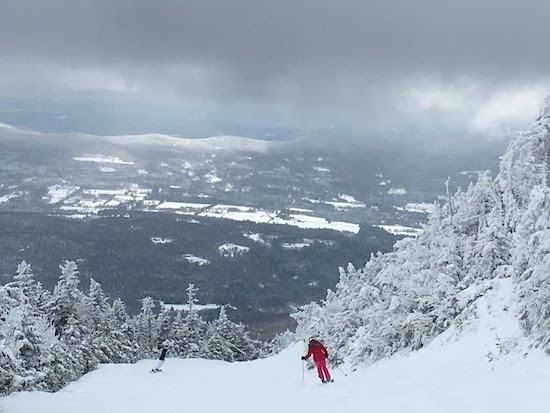 The week before my five days/five resorts jaunt, I skied two other resorts, as well: Mont Tremblant during Diva East, and Stowe Mountain Resort (you can read my blog post about Diva East and Tremblant here). So my count for 10 days? 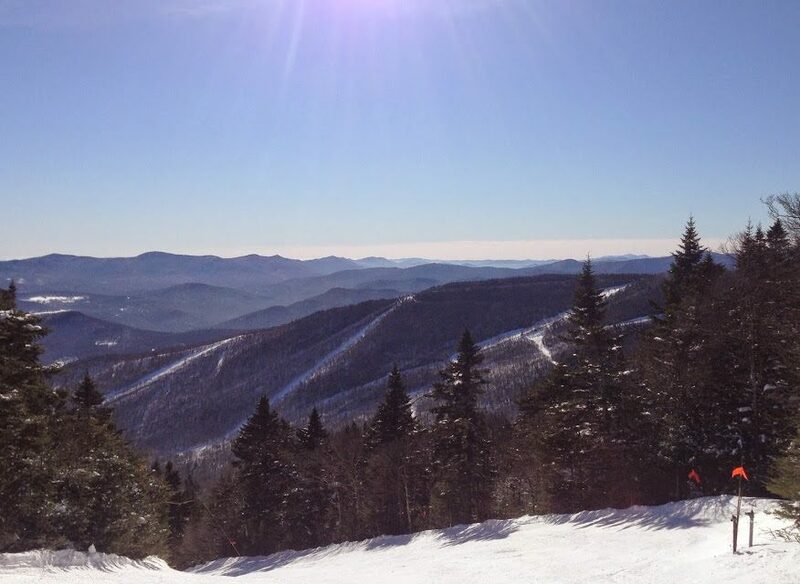 Six Vermont ski resorts, one Canadian. Not bad. I’ll just have to leave the rest for next season. NextSad about the end of winter? It could be Seasonal Affective Disorder. Have I got a pass for you!